Links to information about the area and tours. Start and finish at our center in Axeltorp. The listed price is for two people in a canoe including 2 paddles, 2 life jackets and maps. Let our map help you navigate the lake and the area. Wetlandi is responsible for the care and maintenance of the marked camps on the map – Ivösjöns Arkipelag. Overnight at these places is free for our customers and is included in the canoe rental. Our Inkas 525 canoes are approved for up to three adults or two adults and two children (weight dependant). Life jacket, paddle, and an extra seat is included. Each of the suggested tours (below) begin at different points along the Holje-river. The price listed incloude canoe rental for two people, 2 paddles, 2 life jackets, maps, trail description, packing-barrel and canoe transport. Your adventure begins with a canoe trip down the Holje-river where you will emerge onto the Ivösjön-lake for the second half of the trip. The route ends back at our center in Axeltorp. This route can be paired with a overnight stay of the islands in the lake, or in Humletorkans hostel located enroute down the river. See our info shett on the Holje-river trail. Youtubers paddles Holje-river. This tour follows the same route down the river as the 13 km tour. However, you will end at the boat marina just after the river’s outlet into the lake. Here you will drop the canoe off on the Wetlandi trailer at the marina where we later pick them up for your convenience.. This tour requires two portages, each about 150 meters in distance. Canoe-trolley is included. At the end of the tour, you will drop off the canoe by Västanå-Mill. This tour requires three portages. Canoe-trolley is inclouded. You will drop of the canoe on the Wetlandi trailer by the boat marina where we later pick them up for your convenience. 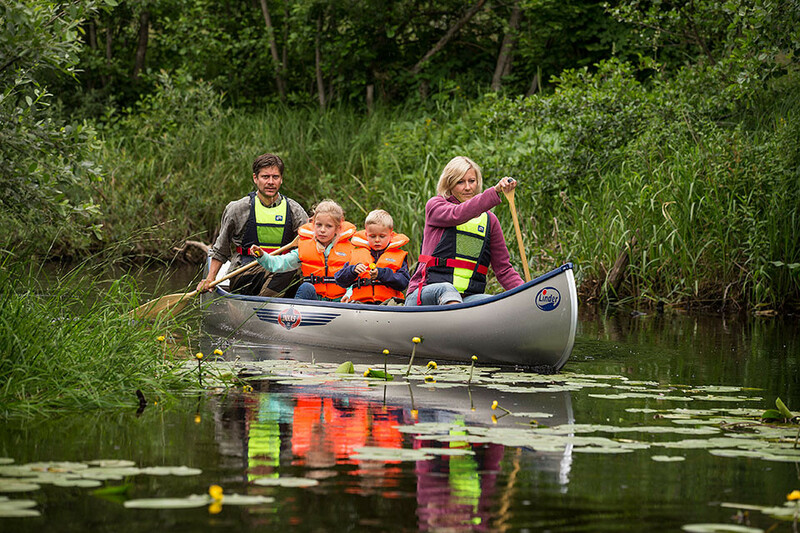 You will canoe 12 km down the Holje-river and 7 km on Ivösjön-lake. The tour ends back at our center. The customer is responsible for passanger transport to and from the start/end points of all tours. If time allowes, we’ll do the best we can to assist with transportation. There’s a bus that runs from Axeltorp each hour to Näsum and Östafors. Both of these starting points are located approximately 500 meters from each bus stop. Link to bus 561. There’s no bus connection to the Klackabacken – marina. 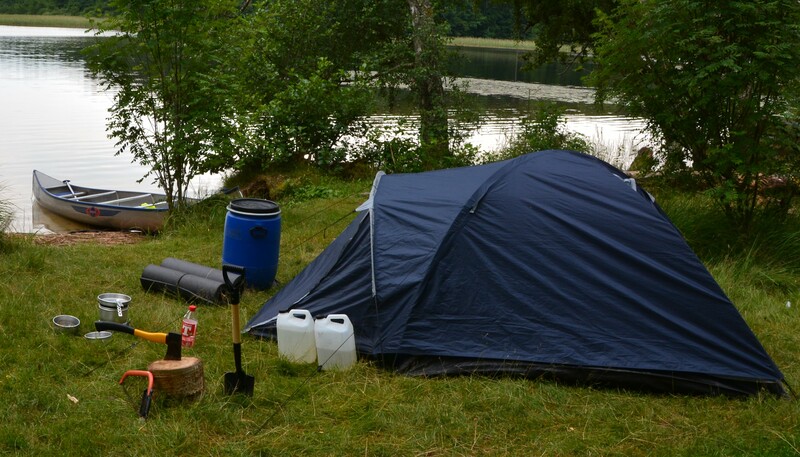 tent for 2-3 people, shovel, saw, ax, two sleeping mats, packing barrel (60 litres), water container, camping stove (fuel not included), cleaning pad. The customer is responsible for the rough cleaning of equipment. Paddle, life jacket, spray skirt, maps, dry bag. Kayake rentals are only availible at our center in Axeltorp, with start and finish point here. Canoe transports can be arranged by request for start – or finishing – points other than those stated above. Prices below include transportation of 1 – 2 canoes. Additional canoes will be an extra cost of 50 SEK per canoe. The price is one way only.